If you like a sweet & tangy BBQ flavor then you might consider smoking a Hawaiian Meatloaf as your next smoke. 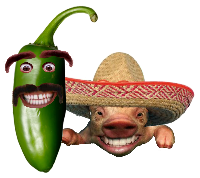 This recipe is sure to please your guests or family and is very easy to prepare and smoke. Mix the maple sausage and ground beef together thoroughly. In a medium mixing bowl combine 1 egg, 1/8 cup Yoshida's, dash of garlic powder and 3/4 of the pineapple juice from the can of pineapple rings. Mix this well. I recommend wearing latex cloves safe for food handling. 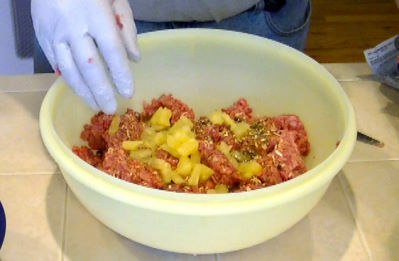 Cut up 3 to 4 pineapple rings into chunks. This will go into the meatloaf adding flavor and moisture. Pour the egg and Yoshida's mixture over the meat. Add 2 tsp sun dried tomato & garlic pesto seasoning, pineapple chunks and 1 cup of Mexican blend shredded cheese mix. With your cloves on knead the meat mix until its thoroughly mixed. Form the meat into a loaf and place on a baking sheet. Mop the exterior of the meatloaf with pineapple juice. Apply a coat of McCormick's Sweet & Smokey dry rub. Shake on some garlic powder and rub in some brown sugar. 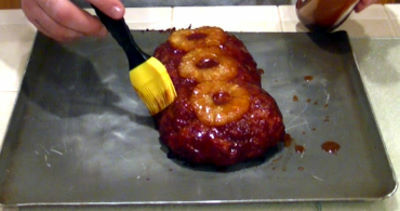 Place 3 pineapple rings on the top of the meatloaf then sprinkle some brown sugar on the pineapple rings. Now you have a pretty sweet looking meatloaf! Place the Hawaiian meatloaf on your smoker grate. 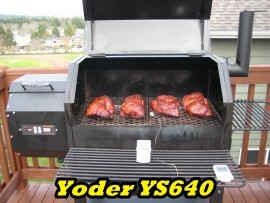 Your smoker should be preheated to 230 degrees. 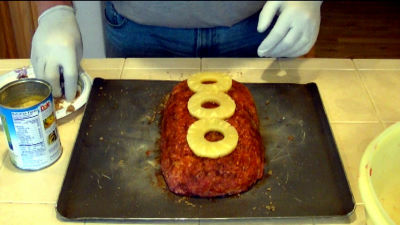 Smoke the Hawaiian meatloaf @ 230 degrees until the internal temperature reaches 165 degrees. 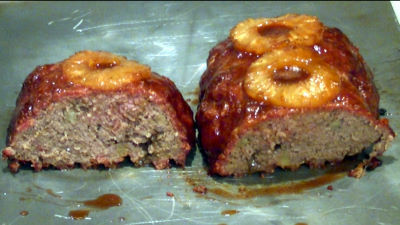 Mist the meatloaf a couple times with a 50/50 mix of pineapple and apple juice. When the meatloaf reaches 150 degrees, mop it down good with a sweet BBQ sauce. I recommend my favorite mix (see below). If you like a darker crust like me, now you can turn the heat up to 300 degrees and finish cooking. This will darken it up a bit. When the Hawaiian meatloaf reaches 165 degrees pull it from the smoker. Give it one last mopping with barbecue sauce. Let it stand for 20 minutes. You now have a moist and tangy Hawaiian meatloaf sure to please. Slice and plate it up!